I’ve read plenty of articles about how dementia changes the person diagnosed with it; but a commentary on how the dementia journey changes you, a loving family member, friend or caretaker, is much harder to come by. That being said, I’ve come across valuable guidance on how to interact with a person with dementia (Teepa Snow), the benefits of caretaker “self-care” (it is a marathon, not a race), the raw emotional impact (Jann Arden), and insights regarding all stages of the condition (Alzheimer’s organizations in Canada, USA, and UK). After reading about #ilivewithdementia, Mildred Lynn McDonald was inspired to share her experiences as a caregiver. In this guest blog, she shares seven pieces of inspirational advice that helped put her own dementia caregiver journey into perspective. But, the deep stuff; the seeds of spiritual transformation that take root within your personal sphere of “being” are seldom discussed (at least, I have not come across it yet). In fact, like most people toggling back and forth between living their own life and providing the best care possible for their loved one with dementia, I didn’t even think about it. Until one day when I stopped to catch my breath and realized that I was not the same person. There was a palatable change in my core. This shift was neither good nor bad, but it was foundational … like new molecules added to my DNA. With this change, I let go of the struggle. I let go of the tears, the frustration. I let go of trying to preserve my loved one’s capacity, mobility, safety and the other quality of life benchmarks. I stopped wrestling with the complexities of dementia; the paradox of dementia; the heartbreak. In its place, I simply started to “be”; be in the present, be with myself, and be with my loved one. I left the logical world and entered the world of feeling, music, touch, and smiles. A world where chronological time ceased to exist and the currencies of empathy, compassion, patience, understanding, and forgiveness were more precious than gold. I entered the world of dementia and in doing so, reset my life compass to a location where I could reach my loved one; because if I wanted to be with them, I needed to reside there too (at least part of the time). Upon reflection, it seems to me that what I experienced on the caregiver dementia path was a form of “enlightenment”. Yes, I know it sounds like a very grand word, but after googling its meaning, I decided that it certainly fits the bill. I’d love to share seven “ah” moments with you in the hope that they also illuminate and sustain your journey as a loving family member, friend or caregiver. At the end of the day, these life-affirming “knowings” offer me strength, perspective and goodwill. 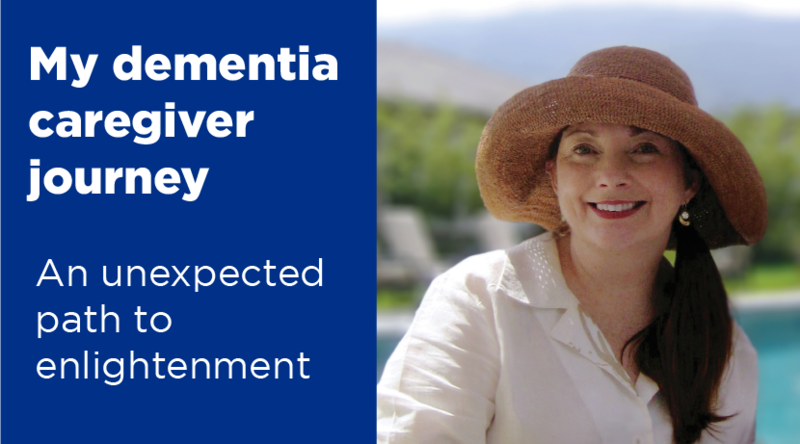 At the beginning of the dementia caregiver journey, I was desperate to understand all things logical: the stages of dementia; the symptoms, the timeframe, the prognosis. Frustration set in when I was told again and again “each person’s journey is different”. Years into the process, and after having had the honor of observing many dementia patients and their loved ones, I now realize that this guidance is true. Every journey is different because there are so many variables and unknowns in the dementia equation. Best to take your foot off the pedal, settle in and cultivate a more relaxed “let’s wait and see” mindset. I remember talking with a friend whose beloved mother was diagnosed with dementia. My friend lived in another location and faithfully drove seven hours (total) each weekend to attend to her mother’s care. After her mother passed away she shared that she regretted nothing; but, upon reflection lamented that she could have taken better care of herself. It is important for family, friends, and caretakers to pace themselves for a marathon, rather than a sprint. On a personal note, self-care for me is an ongoing challenge. By nature, I’m a soft-hearted giver, so I have to build a disciplined self-care practice into my schedule. Left to my own devices, I would end up depleted and as soggy as a wet noodle. People tend to feel guilty when they are not able to visit their loved ones; and on the other hand, sometimes caregivers and other family members are challenged to understand why they are not showing up. I have seen this push-pull dynamic within families many times. What I have learned is that there is no “playbook” for dementia, so setting expectations is tricky. With a health science background, I always thought that I was up-to-date on anatomy and physiology, but caring for a loved one with dementia can often bring the observation of the physical to a new level. As I watch my loved one progress along the dementia path, my level of awareness of their body is heightened and as subtle as a butterfly’s breath. I’m constantly on the lookout for minute changes (good or not so good) and have asked the Universe for the grace to “accept the things that cannot be changed” on several occasions. I have also gained a limitless appreciation for the health professionals and care workers who have the expertise to make my loved one’s quality of life and comfort a top priority. When my loved one first left the family home and took up residence in a longterm care facility, I was determined that she would continue to benefit from the time and attention of treasured family and friends. To this end, our family embarked on a “Stay in Touch” program that has been active for over four years. Encouraging people to visit, sharing regular photos and updates, creating special events, and showing gratitude and appreciation have all been instrumental in ensuring that our mother feels loved, connected and relevant. In a future blog, I will share the specifics of our initiative in the hope that other families will benefit. As a loving family member and caregiver, it is sometimes easy to slide into a place of fatigue, sadness, and loss. To make matters more challenging, until you are on the dementia path with a loved one, it is difficult to truly grasp the journey. For example, prior to my loved one’s diagnosis, I understood dementia on an “intellectual” level; post diagnosis, I now understand the impact of dementia on a much deeper level; a level that includes all of me; mind, body, and soul. For your own precious health and well being, it is important (even essential) to seek out and surround yourself with people who are familiar with the complexities and demands of the dementia caregiver journey. As a first step, contact your local Alzheimers organization; as a second step, find a support group. As a Healing Conversationalist, I can assure you that engaging in regular, honest conversations about your personal caregiver journey will help restore balance, brightness, and hope into your world. As for myself, I attend a wonderful dementia caregiver support group once a month in Glace Bay, Nova Scotia. It has been a life saver! There is nothing like sitting in a circle with a loved one diagnosed with dementia laughing and merrily singing songs from yesteryear! I kid you not; if you are shy or reserved, a few sessions of happy, unabashed singing will make you question why you are holding back in any area of your life. This is what happened to me. In fact, I have to admit that being on the dementia caregiver journey has made me braver and more courageous than any other time in my life; I’m living in the moment, challenging myself to rid artifice from my world, and focusing on what is truly important. Plus, I’m now aware of (and appreciate) the smallest beauty and kindness that life offers me. In short, inhibitions that have held me back are now crystal clear and banished. I’m fully engaged in the “now” and taking big gulps from the cup of life! When I first began this post, I mentioned that being a caretaker for a loved one with dementia has been a spiritual awakening for me; a spark of enlightenment, and the path to self-discovery and change. The ongoing challenge has been learning how to balance my own life with the demands of providing the best possible care for my loved one. I won’t sugar coat it, the balance equation has been a struggle. My overall goal is to complete the caregiver journey with my health, my sanity, and ultimately Peace of Mind. I will be writing more about the about dementia caregiver journey as 2019 unfolds. My hope is that my observations will help and encourage others; just like the observations of other kind souls have helped and encouraged me. The circle continues. Stay tuned! Read more of Mildred’s stories at Healing Conversations with Mildred Lynn. For more information about support, visit the Alzheimer Society of Canada website.